Kimmi came to Hallberg Marine from International Falls, and the beautiful lakes and rivers “Up North” right along the Canadian Border. She brings practical experience from island living where boating was a part of her daily commute. 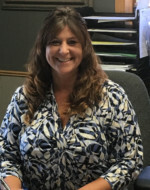 Her true love of boating the lakes and rivers of Minnesota lends a simple transition into the sales team here at the Hallbergs. Family is a number one priority for Kimmi, and she looks forward to helping you get your family out on the water to create memories that will last a lifetime.